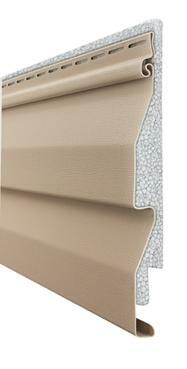 Norandex Vinyl Siding offers a full line of vinyl siding that is affordable, strong and beautiful. Less than half the cost of real wood siding without having to ever paint again. 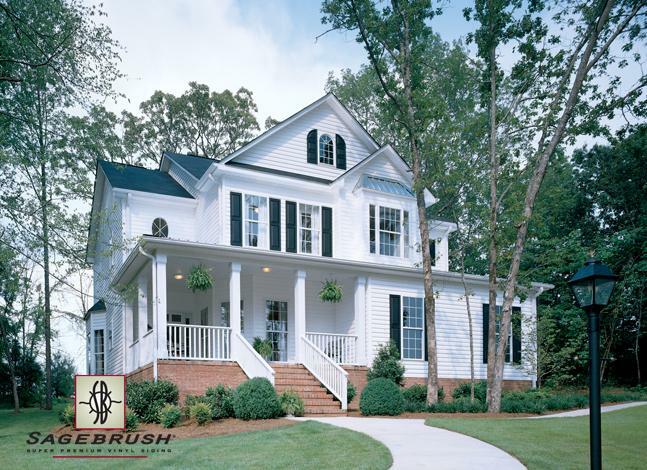 New trim and accent options, ore styles and finishes, and a full spectrum of colors help architects, builders and homeowners achieve their ideal exterior style for any type of home in any neighborhood. 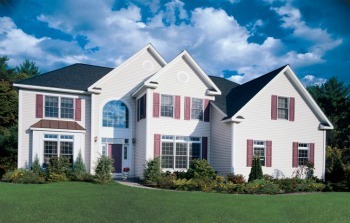 Any style from historic to contemporary is possible with Norandex vinyl siding. Vinyl siding never needs paint. Ever! The only maintenance is will need is a simple wash with a soft brush and garden hose to keep it looking great, a feature today's strapped-for-time homeowners totally appreciate. 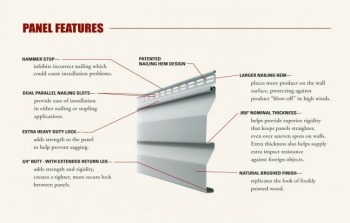 Different Types and Styles of Norandex Vinyl Siding products. 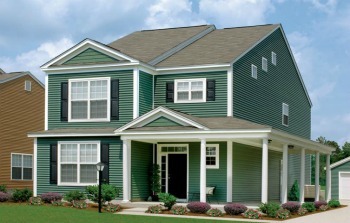 Give your home a true mark of distinction with a unique vertical siding. Expand your architectural options by using Board and Batten for the entire house or simply as an accent panel on walls, gables and porches. Stand out from other homes in your neighborhood with this contemporary style that will have your neighbors talking. 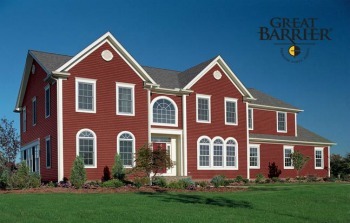 Backed by one of the best warranties in the business, Board and Batten premium vertical vinyl siding is available in a broad spectrum of colors. To go to Norandex Web Site and use their special design tool that lets you see what your house would look like before you buy anything. Design Tool, click here. Comes in premium .050 thick panels. Strong, durable and virtually maintenance free. Never needs paint, will not rot, termite proof and classic styling. Low gloss brushed pattern creates a natural look. 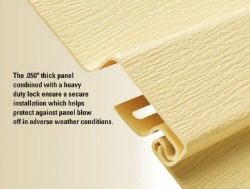 To see Norandex Board and Batten Brochure click here. 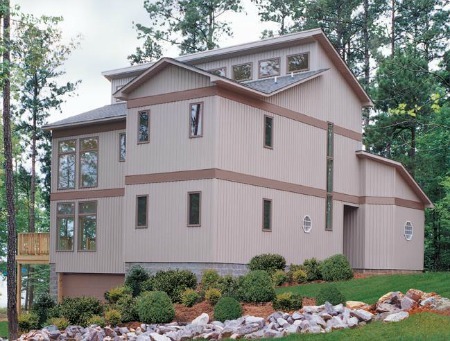 Dutch Lap siding is one of the most popular siding styles. It has been around since early colonial times. Note the notch running along the top edge of the panel. This gives the panel a distinctive shadow line and sets it apart from other horizontal lap siding. In olden days, each wooden board had to be hand cut to provide the notch. This made Dutch Lap siding more expensive than regular wooden clapboard and was commonly used by the more well to do homeowners who wanted something distinct. 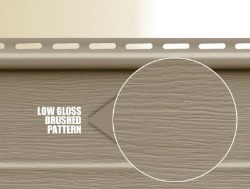 Insulated Norandex vinyl siding is stronger and more ridged than non-insulated sidings. It withstands high winds better, offers more energy savings by lowering your energy costs over time. It costs a little more to buy than non-insulated sidings but should over-come the high price with savings for decades on your heating and AC bills. It also reduces the outside noise levels making it an especially good choice if you have heavy traffic noise. 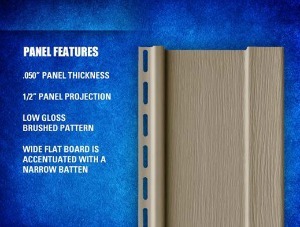 Click here to see more information on Norandex insulated vinyl siding products. With Great Barrier Premium Vinyl Siding it's what's under that really counts. The XLok technology features JawsLock, a superior full reversed rolled-over nail hem that doubles the thickness of the panel where it's nailed to the wall. Great Barrier includes an array on natural colors as well as an expansive collection of darker shades with tremendous home-owner appeal that resist fading and discoloring via our proprietary ColorHold acrylic technology. Additionally, if you are looking for an authentic look found only in special kinds of woods choose premium vinyl siding from The Blends Collection. Each panel has its own unique wood-grain pattern giving it a special, distinctive character. 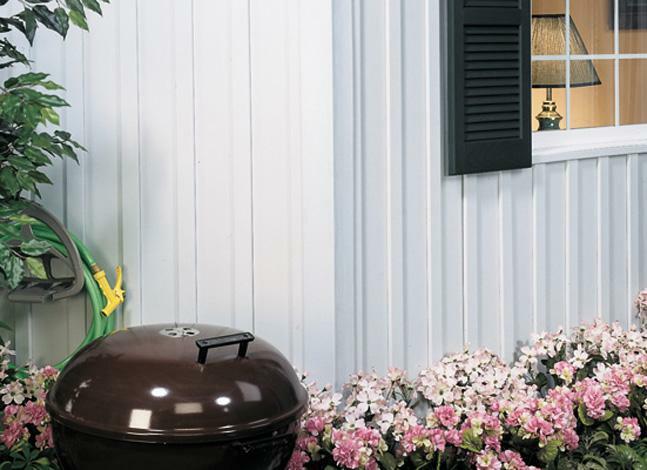 There is a Norandex vinyl siding product to fit every budget, style and color that you could ever want. Like one of these products? If you like any of these products gather some information on the type of siding you like and write it down so you can go over it with your contractor. If you think you might like this type of siding make notes in your workbook and go over them with your contractor. Once you have picked out several types, styles, colors, thickness and textures, sit down and ask your contractor for his input. He does this type of work all the time and may offer you some money saving tips. To review more vinyl siding styles, clapboard, dutch lap, beaded, smooth lap, click here.